How much can you contribute to a Roth IRA in 2017 or for 2016? These limits are the same as they were for 2015, 2014 and 2013. For even older limits, see the table at the bottom of this article. Although contribution amounts did not change from 2016 levels, income limits changed slightly. You must have earned income to make a Roth IRA contribution. The amount of earned income you have must equal or exceed the amount of your Roth IRA contribution. If you have enough earned income, in addition to your own Roth IRA contribution, you may make a Roth IRA contribution for a non-working spouse. If you have too much income, then you are not eligible to make a Roth IRA contribution. Do You Have Too Much Income to Make a Roth Contribution? For single filers - your ability to contribute to a Roth IRA in 2017 is phased out as your modified adjusted gross income (MAGI) reaches the range of $118,000 - $133,000. For 2016, this range was $117,000 - $132,000. For married filing jointly - your ability to contribute to a Roth IRA is phased out as your MAGI reaches the range of $186,000 - $196,000 in 2017, up from the 2016 limit of $184,000 - $194,000. If you are eligible to make a Roth IRA contribution based on the income limits above, then you can contribute to a Roth IRA in addition to your company-sponsored retirement plan. If your income exceeds the limits above you may be able to make a non-deductible traditional IRA contribution and then a year later convert it to a Roth IRA. Roth IRAs offer many advantages such as the ability to withdraw your original contributions at any time without being subject to income taxes or penalties. Also, they offer significant advantages once you are retired. Most people who are eligible to make a Roth contribution should consider doing so. If your income is within the limits described above you may make a Roth IRA contribution for a non-working spouse who has no earned income. It is called a spousal IRA contribution. You have until April 17th of 2017 to make your 2016 Roth IRA contribution. You have until April 16th of 2018 to make your 2017 Roth IRA contribution. The contribution and income limits described above apply to contributions. 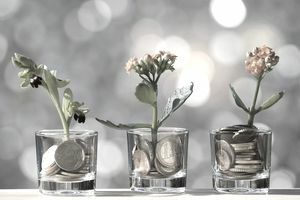 When you convert a traditional IRA to a Roth IRA that is not considered a contribution - so Roth conversion amounts are not subject to the limits above. It used to be that if your income was over $100,000, you could not convert IRA money to a Roth, but that tax law changed, and that income limit was removed in 2010. You can convert IRA money to a Roth at any time, and there is no maximum limit on the amount you can convert. A Roth IRA is different than a Roth 401(k). Roth 401(k)s are referred to as Designated Roth accounts and the income limits described above do not apply to Roth 401(k) contributions. Roth 401(k) contribution limits are the same as regular 401(k) contribution limits. If your employer offers a 401(k) account, you can check with the plan administrator to see if the plan allows for Roth contributions. Not sure whether to make a regular IRA contribution or a Roth IRA contribution? The Traditional IRA may offer a tax deduction for the amount contributed, whereas the Roth does not. However, when you withdraw money from a Traditional IRA, you will pay taxes, whereas qualified distributions from a Roth are tax-free. Can My Roth IRA Double as My Emergency Fund? You can always withdraw your contribution amounts from a Roth, and you pay no taxes or penalties when you do this. It means a Roth IRA could do double duty as your emergency fund. The amount you can contribute, and the income limits, are both indexed to inflation, which means the higher the inflation rate, the more likely you are to see limits go up. The contribution limits go up in $500 increments. The income limitations go up in $1,000 increments. Historical limits are listed in the table below.